Amazing Food, Drink & Views at Holmfirth Vineyards. Dine with us. Enjoy a hearty Yorkshire breakfast, settle down for a light lunch, indulge in a traditional afternoon tea or simply relax with a glass of wine after work in wonderful surroundings. 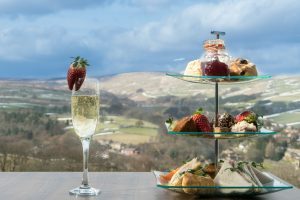 Our Tasting Lounge allows you to soak up the breathtaking panoramic views of the Holme Valley all year round, whatever the weather, from the restaurant, conservatory or outside terrace. Complement your meal with one of our own wines or sample one from our extensive wine list. Our experienced team will help you make the right choice. Our evening A La Carte menu (available Friday and Saturday evenings only) has been designed to complement of our wine grown and produced here at the vineyard, and provides a refined and memorable culinary experience. Open 7 days a week from 9.00am. Group booking? Sheveling Wine Estate provides a stunning venue for your get together. Book online or speak to a member of staff. Private functions welcome. The restaurant, conservatory and outside terrace are available to book for private functions. Book online or speak to a member of staff.